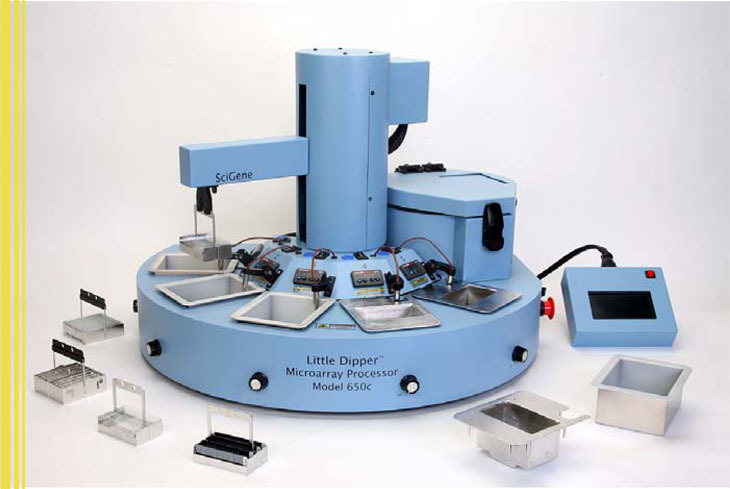 The SciGene Little Dipper Processor for BeadChips [Ord. #1080-30-2 (220V)] is a programmable robotic system that replaces the multistep manual process normally used for post-hybridization processing of Illumina BeadChips. Batches of up to 12 BeadChips are moved at programmed times between five temperature controlled baths containing wash buffers or blocking/staining reagents. While submerged in each bath, BeadChips are reproducibly washed, blocked and stained by a combination of up/down agitation and stir bar vortex action. The final drying step is automatically performed in an integral centrifuge. The SciGene Little Dipper Processor for BeadChips is designed to conserve the consumption of buffers and reagents. Low volume bath trays and a low profile, 12-position rack work together to minimize the amounts of buffers, blocking and staining solutions needed. Instrument operating costs when processing typical batch sizes are equivalent to manual methods. After filling the bath trays and setting the buffer temperatures, BeadChips are removed from Illumina hybridization chambers and placed into a simple to load, 12 position slide rack. After inserting the rack onto the Little Dipper robotic arm, the instrument takes over and performs the elevated and room temperature washing steps. Blocking, staining, final wash steps and centrifugal drying are then completed on the instrument after an exchange of bath trays. The Little Dipper Processor for BeadChips comes fully outfitted, ready to use for processing BeadChips for gene expression or genotyping. The system arrives with all of the necessary components and with a validated protocol for gene expression pre-loaded. Training takes only a few minutes. Following the User Guide, fill the baths with Illumina-supplied buffers and reagents, press Start on the touch screen and load the BeadChip rack. The Little Dipper Processor can be easily configured and programmed to perform all commercial and self-spotted array processing protocols as well as FISH procedures. An Upgrade Kit for Agilent and NimbleGen Arrays (Cat. #1080-41-0) is available.